Other features: doorway in paneled recess. Historical significance: owned by J. Moody Russell (1870 assessor's valuation), house, barn, 5 acres of land. J. Moody Russell's son built in 1840, (Kim) Archimedes. J. Moody was a builder, and Kim was an architect. 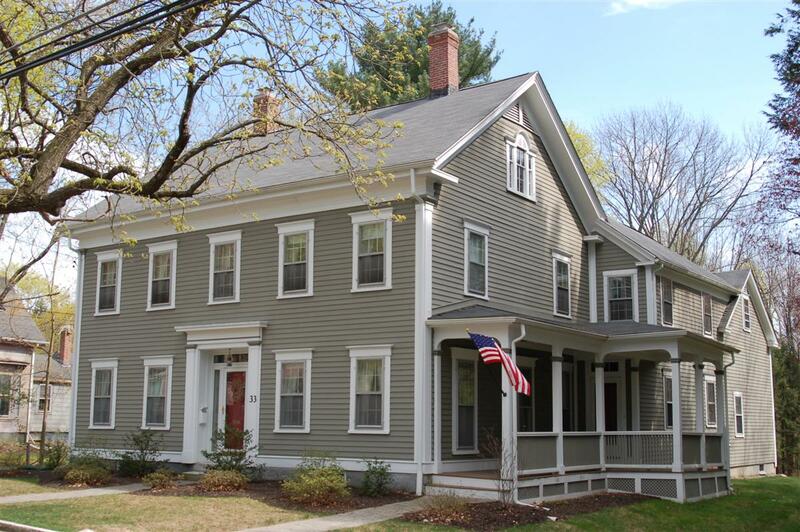 This home was built by Moody Russell, an Andover Carpenter and Real estate investment businessman. Moody Russell was born on Sept. 1, 1808 in Alfred, York Co., Maine, son of Clement & Nancy (Warren) Russell. Moody married Frances :Fanny Wardwell b. Sept. 7, 1804 in Andover, MA, daughter of Gideon Church and Joanna (Durant) Wardwell. Moody & Fanny would have seven children: Moody C. b. 1830 d. Sept. 22, 1878, Laura F. b. July 1832 - d. 1918, Sylvanus b. 1834 - d. July 1917, Georgette b. 1836, Cornelia Agnes b. Feb. 9, 1838 - d. Dec. 3, 1879, Archimedes b. June 13, 1840 and Wilhelmina b. May 31, 1845. The 1850 Andover Valuation schedule lists Moody Russell 1/8 acre, house and barn $1000. Frances F. Russell died on Oct. 15, 1892 and is interred at Spring Grove Cemetery. Moody died on Dec. 17, 1894 of Heart Disease. He was 86 years of age. Moody created his will in April 1894. To his daughter Wilhelmina Doe $3000., dau. Laura F. Smith $2000. dau. Georgette Ramsdell $3000., son Archimedes Russell $2000. and son Sylvanus $1000. To my grand-child Mabel Smith all my real estate at my death. Archimedes Russel & Henry P. Doe were the Executors of the estate. Moody's daughter Laura F. Russell married on Feb. 6, 1853 to Thomas Smith b. Mar. 21, 1820, in Andover, a shoemaker, age 33 son of Thomas & Betsey Smith. Laura F. and Thomas' daughter Mabel Frances Smith b. May 1868 inherited the house. Mabel married Albert W. Lowe, b. July 1863, a druggist. Albert W. Lowe had a Pharmacy in the Draper Block at 33 Main St. 1902 -1907. George H. Parker, apothecary occupied #33 in May 5, 1871. In 1900 Albert W. Lowe became associated with Parker’s business and purchased it in 1902. Lowe moved the drug store to the new Press building across the street at #60 in Jan. 1907. Press Building in 1907-1924, then in 1924 moved to the Barnard Building #18 Main (formerly Crowley’s Pharmacy 1911-1924,) who sold to Lowe 1924-1943. The Pharmacy then became Dalton’s Pharmacy in 1943-1967, Hughes Pharmacy1967- March 1, 1991. Allan Hughes died on January 9, 1991 ending 143 years of an Andover owned drug store business that began as John J. Brown’s Apothecary in 1843 at 9 Main St.. CVS bought the stock of the Hughes estate. Mabel & Albert Lowe had two children, Lucretia b. May 1895 and Phillip Russell b. June 1897. This home would remain with the Lowe family for 89 years, selling to Harold A. Rutter Jr. & Stephen B. Rutter on Feb. 1, 1983.